Once upon a time there was – the L handle and the T handle which had been around forever and worked OK but had their limitations. So the people at EMKA who understood this considered an alternative approach. 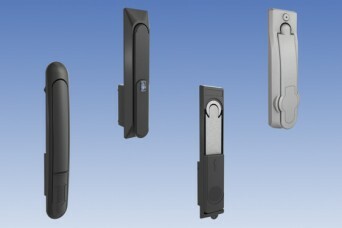 The new concept was for a low profile housing, with the mechanism integral to the escutcheon and a folding handle submerged into the body of the lock – making it almost flush to the door and only accessible by key – thus dealing at a stroke with clothing safety, vandalism and transit damage issues. This also freed designers to think further about how to deal with issues such as ease of installation, customisation, variants and options, new styling cues and enhanced functions which became possible. 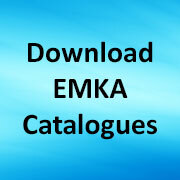 EMKA first introduced two basic models – the 1107 and 1125 programs which the UK enclosure market took a liking to for their solid feel along with their new fresh look and modular design approach, which also represented a massive advance over the traditional L and T handle designs. 1992 saw the 2100 series developed for a reduced cabinet footprint to maximise space in server rooms etc. with the protrusion of the handle being reduced by up to 50%. With this handle also came advances in rod systems to offer flexibility with cost savings, as hook rods and twisted-rod systems were added to the standard flat-rod system. By 1994 we had the first version of the 1150 in its basic two size options as customer individuality became even more of a driving force leading to the 1160, 1180 and the 2400 series in the late 1990’s. In the background, there continued to be a steady increase of options for the 1150, originally in zinc die, to include variants in polyamide and polyamide/zinc die. Again reflecting market need, this process included the development of Stainless Steel swinghandles especially for the UK market. These new modular ranges brought forward a wealth of new design functionality which included miniturised versions, digital code locks, shuttered cylinders, padlockables and ultimately electro-mechanical release mechanisms. Ultra-low profile escutcheons were developed which blend smoothly into the door contours and new standards were set in simplified hole punchings and mounting systems to speed and simplify assembly in the production and installation processes. With the 2400 program the cycle came full circle when customers demanded larger exterior handles with the mechanisms moved from behind the door as far as possible while retaining the basic conceptual and practical advantages inherent in the swinghandle approach. The introduction of the 1190 Lift Handle moved away from the traditional up-and-down rod movement to a lever handle moving a single rod in one direction – further narrowing the space required for installation. IP sealing requirements continued to push development especially in the 2600 program which enables the customer to have a limited area for the rods outside the sealed area and all the operating system of the handle on the front of the door. By 2000 new demands were on the agenda of specialist cabinet users – in particular the demand for electronic security systems This was met when we introduced single point electronic locking with a solenoid to suit the well established 2100, very quickly followed by the 1180 and the 1154. A full network solution giving remote monitoring and operation of cabinets within a data centre went further including special handles to include operating keypads. Popularity of the 1125 called for an easily interchangeable electronic option with the same mounting cut-out which became the 1150 range – with number of options to cover many sorts of hole cut outs already in common use and making the 1150 the most flexible handle in the EMKA range. Coming right up to date customer requirements have now defined the 3000 series handle with self-contained power supply, wireless radio key and the ability to interface wirelessly with the EMKA electronic monitoring system, giving greater control in monitored workshops over machine control access etc. All along has been been the issue of vandalism – where development of electronic locking systems has given EMKA the ability to leapfrog ahead with the vandal resistant 1154 lock program suitable for use on roadside cabinets e.g. for telecoms. 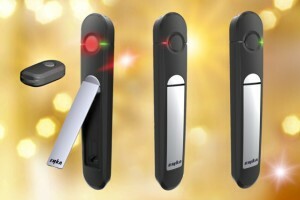 Share the post "Swinghandles – how a new product evolved from a basic idea"